Australia has a lot to offer when it comes to visiting sport buildings and watching all types of events. Football stadiums, horse racecourses, motor racing tracks, rugby and cricket arenas – you name it. No matter what you enjoy to watch, there’s a sport complex that will take your breath away with its design and atmosphere. And watching a match in some places can be a truly special experience beyond the excitement that comes with the game. That’s one of the main reasons why sport is so highly valued in this country. Let’s talk about 8 architectural masterpieces of sport buildings that you must check out while in Australia. The Melbourne Cricket Ground or often times referred as “The G”, is the home to the Melbourne Cricket Club. Built way back in 1853, this is the largest stadium in Australia, and 10th largest in the entire world. The MCG has a total capacity of 100,024, and 109 executive suites. 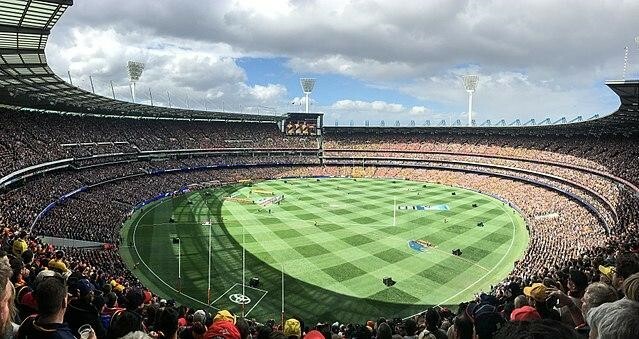 Last year’s AFL Grand Final shows how good the atmosphere can get on this stadium, as there were only 3 not-occupied seats. There are number of very important events that took place on the Melbourne Cricket Ground and add on the stadium’s rich history. The 1956 Summer Olympics, the 2006 Commonwealth Games and two Cricket World Cups – just to mention a few that stand out of the crowd. The MCG is listed on the Victorian Heritage Register, and in 2005, it was included in the Australian National Heritage List as well. This shows how special the building is for Australian cricket and the world of sport in general. So if you’re ever in Melbourne and want to watch a cricket or a football game, make sure to visit the Melbourne Cricket Ground. If there are no events at the time you’re visiting, you can also take the tour and get familiar with the main features of this impressive building. Horse racing and horse racing betting are big in Australia. There are number of very popular venues where fans go to enjoy the thrill of horse races and place bets. Nowadays, people also like to place best online to avoid waiting in the long queues before the race starts. You can read more here to learn about this trend. And when it comes to horse races, the 1.27 square kilometers Flemington Racecourse is the place to visit – period. 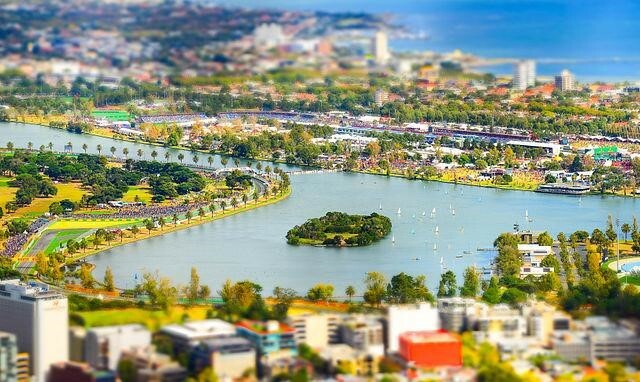 Located in Melbourne, Victoria, this racecourse is most famous for hosting the Melbourne Cup – the world’s richest handicap and 3200 metre horse race. This venue has a capacity of over 120,000 fans and has three grandstands. One of the most attended events in the history of the Flemington Racecourse was the Victoria Derby in 2006, when 129,069 people saw the race. Just as the Melbourne Cricket Ground, the Flemington Racecourse was added to the Australian National Heritage List, and it is an important addition to the country’s most fascinating sport buildings list. Don’t let the name confuse you, this is not Manchester City’s stadium in England. But it’s pretty close to how it looks and feels. The Etihad Stadium in Melbourne is a modern looking venue with the capacity of 56,000 seats. It’s a great place for hosting all types of events including concerts, football, rugby, soccer and cricket games. The retractable roof adds on the stadium’s appeal and makes the views from the stands even better. The Suncorp stadium or also known as Lang Park, is a multi purpose sporting venue located in Brisbane, Queensland, Australia. This 52,000 stadium is the home of Brisbane Broncos, Brisbane Boar, Queensland REds and the Maroons. Watching a match here can be a very pleasant experience, but there are also a lot of concerts hosted. No matter the occasion, the atmosphere in the stadium is really something. So next time you’re travelling through Brisbane, make sure to check out this venue and ideally, watch a game. Adelaide is the capital city of the state of South Australia, and it it a very interesting place to visit with tons of cool places and tourist attractions. It’s also the home of one of the most beautiful stadiums on the continent – the Adelaide Oval. This sporting venue is located in the parklands between the city centre and Northern side of the town. It is primarily used for cricket, Australian rules football and rugby. But there are also soccer and tennis matches and concerts hosted on the ground. Sport journalist Gerrard Whatley described the Adelaide Oval as “the most perfect piece of modern architecture because it’s a thoroughly contemporary stadium with all the character that it’s had in the past”. The Brisbane Cricket Ground or the Gabba is one of the most popular stadiums in Brisbane. It’s nickname comes from the suburb in which it is located called Woolloongabba. Established in 1895, this stadium is the home of the Queensland cricket team, Brisbane Lions and Brisbane Heat. The 42,000 capacity makes up for great entertainment and atmosphere for both, players and the fans. This stadium is not just for hosting cricket games though. Over the years, it has been the home of concerts, cycling, athletics, Australian rules football, soccer and greyhound races. Up to now, we talked about a number of cricket, rugby and soccer stadiums, and horse tracks. But what about sport buildings where extreme sports take place? The Melbourne Grand Prix is the first street circuit that comes to mind. Opened in 1953, the 5.3 km race track is an iconic complex with the capacity of 80,000 seats. It is used each year as a racetrack for the Formula 1 Australian Grand Prix, Porsche Carrera Cup Australia and the Supercars Championship Melbourne 400 race. The Melbourne Grand Prix Circuit is considered to be relatively easy and fast to drive – as described by professional drivers. The curves on the racetrack are easy to learn, mainly because of the consistent placement of corners. This allows for very exciting and competitive races that are always more appealing to viewers. During the time 9 months of the year when the track is not used for Grand Prix or race weekends, people can drive the Grand Prix Circuit with regular, street vehicles. This is really awesome, as you can experience the track from the perspective of a professional F1 driver. Currently known as the Blundstone Arena, the Bellerive Oval is a cricket and Australian rules football ground. It is located in Bellerive, which is a suburb on the eastern part of Hobart, Tasmania, and is the only stadium that’s licensed to host international cricket matches. This is also the home of two cricket teams: the Tasmanian Tigers and Hobart Hurricanes. Even though it has the capacity of 19,500 spectators, things can get very exciting during a game. The Bellerive Oval is the home to international Test matches since 1989, and one-day matches since 1988. Due to the importance of these events, the stadium was significantly improved with its facilities. Located in Western Sydney, the Rosehill Racecourse is a popular horse racing venue that hosts races for thoroughbred gallopers on a grass surface. This horse racing track is 2,48 meters long, and has a home straight of 408 meters. One of the most popular events that are hosted on Rosehill is the Golden Slipper race. If you’re a fan of this sport and happen to be travelling through Sydney, make sure to visit the Rosehill Gardens Racecourse. It will be worth your while!